We all know the utter misery of heading out to work, making it to the office and then getting caught in a freak yogurt explosion at the vending machine. Now you’re covered in sugary, purple ooze and you’ve got the big presentation in ten minutes! What will you do? We have heard your concerns! We have listened to your problems! And we think we have something that can solve this pressing need: the Portable Bathtub 3000. With this handy dandy invention, you can take your bath anywhere… literally. Finally, you’ll be able to easily clean up after eating barbeque pork ribs at the local rib shack. You will no longer have to fear falling into puddles. If you accidentally open a soda can that had been shaken up and then sprayed you everywhere, you can shrug it off. We admit, there are still a few flaws with the prototype. It currently weighs 225 pounds, which we admit can be difficult for the average person to carry. It’s also cumbersome and unwieldy for your morning commute. And you need to drag a hose with you wherever you go to provide the water. We promise that these things will be worked out by the time we receive the patent. Until then, you can have the next best thing with this Adult Inflatable Man in Tub Costume. Lightweight and easy to get into, the tub is guaranteed to stay inflated while you party thanks to a battery operated fan. 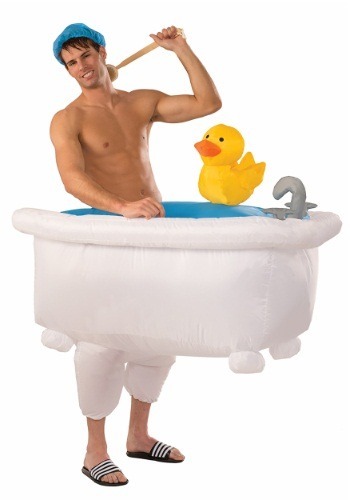 It also comes with a cute shower cap and yellow rubber ducky, which is attached to the edge. It’s the perfect way to make a splash at your next costume party. Standard Tub Size (deflated approx) 49" x 31" 49" x 31"